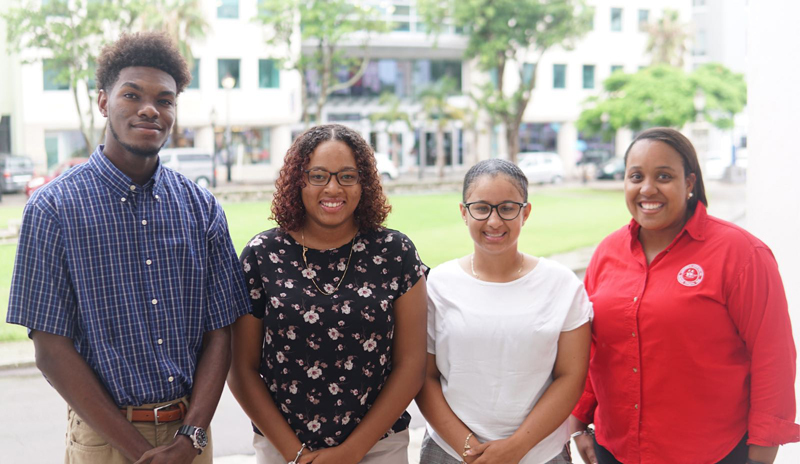 The Continental Society of Bermuda has awarded bursaries to three students to assist them with university. The winners are Krishun Douglas-Henry, Tae-Eja Bean and Kayjuna Lema. Mr Douglas-Henry won the top prize and received a $6,000 bursary. Ms Bean was the second place winner of a $4,000 bursary and Ms Lema won a $1,000 bursary. They were selected out of 145 applicants. The scholarship has been in existence for more than 20 years. The amount awarded is typically $4,000 in total, but due to generous support of donors this year, the Continental Society had enough funds to support multiple students. Denise Simons, President, Continental Society of Bermuda, says: “For more than 15 years, we have been able to award deserving students with bursaries to enable them to further their education. The top winner, Douglas-Henry, will attend Northumbria University in Newcastle, UK to study finance. He was inspired to study finance thanks to one of his teachers and his shadow experience at Bank of Butterfield. Mr. Douglas-Henry is a graduate of Warwick Academy and is an avid sportsman, playing football locally as with the Chelsea FC Academy in the UK. He has also volunteered in the community by helping to clean seniors’ yards and homes. Ms Bean will attend Bermuda College next month after graduating from Berkeley Institute earlier this summer. She wants to be a drama teacher after being a part of the drama clubs at school and taking on a leadership role in those organizations. Ms Bean is a candy striper at the King Edward VII Memorial Hospital and is currently working at Carolina Bay. Ms Lema is currently in her last year at Manchester Metropolitan University studying forensic psychology. She graduated from Berkeley Institute in 2013 and attended Bermuda College from 2013 to 2016. Ms Lema is a previous bursary recipient and this award will enable her to continue her studies. The Continental Society of Bermuda is an affiliate chapter of the Continental Societies Incorporated, an international public service organization committed to improving the welfare of children in communities across the USA and Bermuda. Founded in 1962 as charity number six, the Continental Society of Bermuda is supported by 100% volunteer membership of approximately 30 Bermudian women. For more information on the Continental Society of Bermuda, email continentalbda@gmail.com.